These quality bronze Chau Gongs (or Tam Tams) are hand made in Wuhan, China. The bronze is an alloy of 77% copper and 23% tin and is virgin material, not recycled bronze as used in some cheaper inferior gongs on the market! They are slightly convex with a slight rim, the centre spot and rim are left coated on both sides with the black copper oxide that forms during the manufacture of the gong, the rest of the gong is polished to remove this coating. 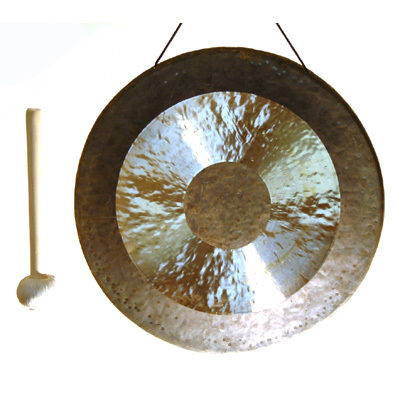 Chau Gongs give you a distinct gong sound that is responsive enough to produce rich overtones with an enormously wide range of volume.The sound is very grounding, at the same time melodic with an organic quality, making these gongs very popular with sound therapists. Supplied with padded carry case and soft mallet. Available from stock in 9 sizes; other sizes available to order. As these gongs are handmade all sizes are approximate.